The Hubert 100 2017 | JustRunLah! Discounts are also available for AURA and Ultra168 Members, and past Yumigo! Volunteers. See Entry Form for details. Volunteers will need to email Ben for a code. It's back again! Whether you are a returning runner or taking part in thbs event for the first time, you will be spellbound by the spectacular world-renowned Ikara-Flinders Ranges! Even more exciting to announce is that we have an official 100km and 100 mile addition to the program. You now have a choice of four events: 42.2km/50km/100km/100 miles. And if you aren't able to run on the Sunday, we have the shorter special Wilpena Pound Resort Ohlssen Bagge Challenge event on the Saturday. This event is a 6km out-and-back of the Ohlssen-Bagge peak, a run designed especially for family and friends of runners in the main events. Or even the runners themselves if they are keen for a warm-up! The run starts only 1km from the Wilpena Pound Resort store so you barely have to leave your accommodation to get to the start line. One of the most geologically-significant locations for humankind on earth, the Flinders has long been a favourite destination for scientists, explorers and hikers. Now it is your turn as an adventurous trail runner to take part in this, the most unique trail event you will ever be a part of in Australia. The event itself is named after Sir Hubert Wilkins, who was one of the last renowned traditional explorers, opening up some of the last previously-inaccessible parts of the world. Born in South Australia's mid-north, Sir Hubert was among many things a pioneer, an adventurer, a scientist and an award-winning photographer. Underpinning it all was a thirst for knowledge, and his perseverance and adventurous spirit saw him achieve more than what 1000 men usually achieve in a lifetime. One of Sir Hubert's lines was that "adventure is just a word used to describe a series of unplanned surprises", and our aim is for you to experience lots of these (good) surprises during your time in the Ranges. Sir Hubert spent lots of time exploring the region so many of the vistas you look at in wonder were probably the exact same ones he gazed upon over 100 years ago. 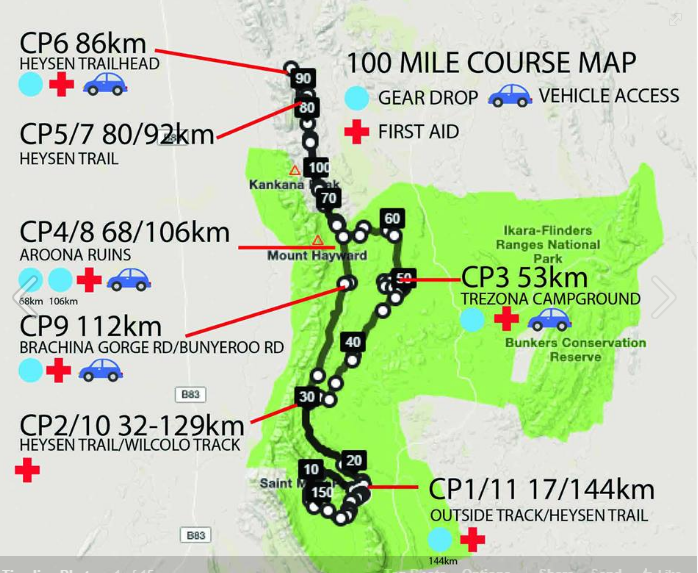 Razor-sharp mountain peaks will be your backdrop as you run your way along fire tracks, through dry creek beds, over rolling rocky trail and up an arduous climb to Tanderra Saddle before finishing at the Wilpena Pound Resort. Australian wildlife abounds with several types of kangaroos in abundance, lots of emus and rabbits, and you will also likely see Australia's largest bird of prey, the Wedge-Tailed Eagle, in the wild. But most of all, the sense of history in the landscape will be what strikes you the most. It is like nowhere else in Australia. Remnants of what used to be a mountain range higher even than the Himalayas are everywhere, and some of the oldest fossil evidence of animal life on earth has been discovered here. You will literally be running through ancient history. And to top it all off, you will only be seeing a small portion of a range that extends hundreds of kilometers north. The Ikara-Flinders Ranges is less than a six hour drive from Adelaide, and there are lots of choices for accommodation in and around Wilpena Pound. However with the buses departing the Wilpena Pound Resort to take runners to their respective race starts first thing on race morning, and with the event finishing at the Resort, it is highly recommended that you book either in the Resort itself, or nearby. Please see www.yumigo.com.au/hubert/ for a list of accommodation options.